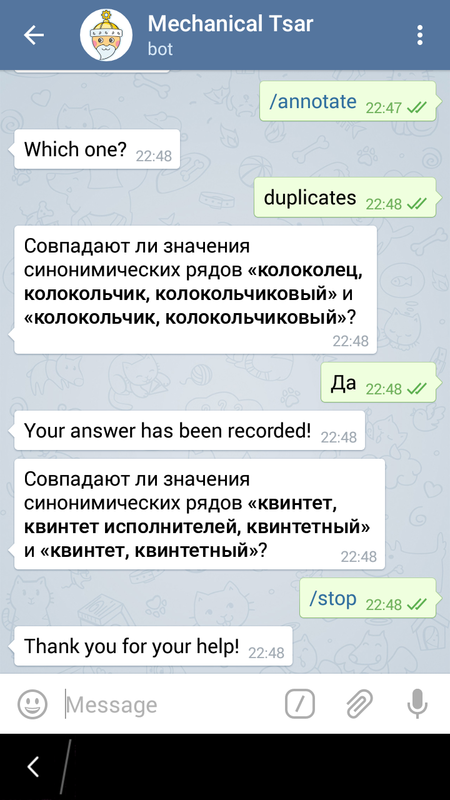 Teleboyarin is an open source instant messaging bot designed for crowd annotation via Telegram. 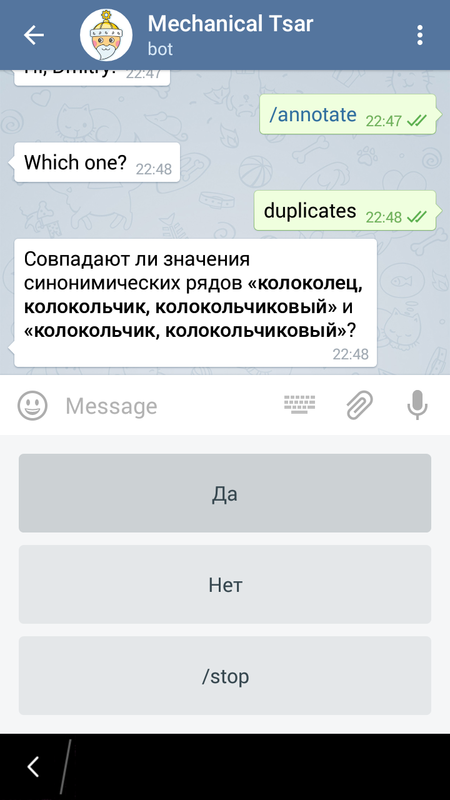 Telegram is a cross-platform instant messaging system that provides a convenient Bot API for building chatbots, which interact with a user or with a group of users. The API provides additional methods for augmenting communication, e.g. rich text formatting, input completion, command lists, etc. The three-tier architecture of Mechanical Tsar requires annotation bot to implement the application layer, i.e. it should identify users, provide them with tasks, receive answers from them and deliver the corresponding data from and to the engine over its API. Since all the Telegram users get a unique user identifier (ID) verified by a cell phone number, it is sufficient to represent the users with the above mentioned IDs in order to eliminate the identification problem. Source code of Teleboyarin is available on GitHub under the MIT license: https://github.com/mtsar/teleboyarin. 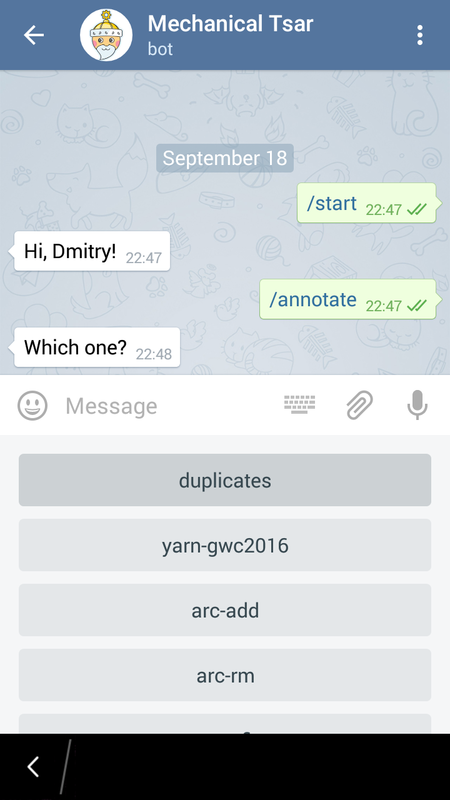 Indeed, similar functionality could be implemented in other messaging systems like Jabber, Slack, WhatsApp, etc. Updated: October 13, 2015. A short paper on Teleboyarin is accepted for publication in proceedings of the AINL-ISMW FRUCT 2015 conference. Updated: November 24, 2015. 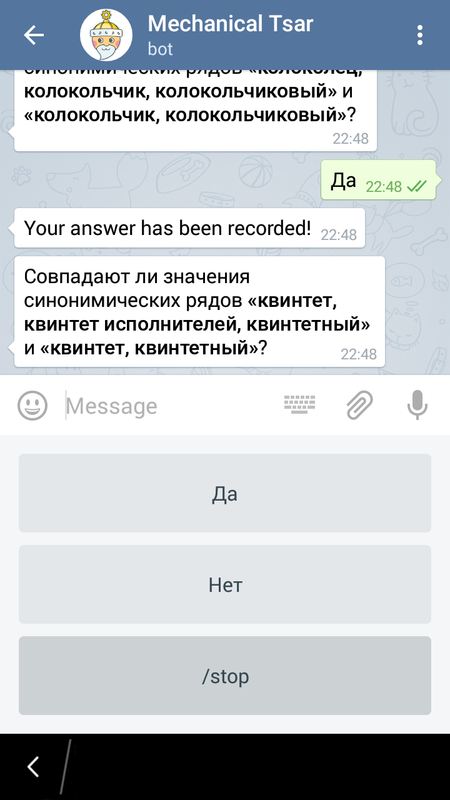 The paper Teleboyarin—Mechanized Labor for Telegram has been published.